Ihave two paying jobs that I am thankful for and that I enjoy. 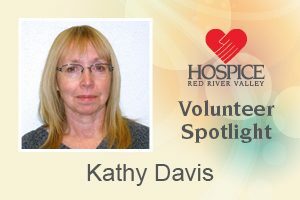 But my time with Hospice and my other volunteer job make me feel like I am making a positive contribution to this life. I am amazed at so many things I see in the people I visit. Even when they know they are facing death, they can laugh and stay true to themselves — they are still who they have always been. The personal stories and stories of family memories are so good to hear. Sometimes a family member can look so tired. I am glad that I can show up and they can take a small break or go visit another family member in a nursing home. I like how you can just feel the love in the room by looking at pictures of happier days. A perfect day for me would be a day where there is more laughter than tears, more kindness than pain, more light than darkness.